Eggs and beans are packed with protein and vitamins, and with the fiery kick from the chilli this meal will definitely keep you on your toes! It’s perfect for dinner and the leftovers (if you have them) make a healthy pre-run breakfast. 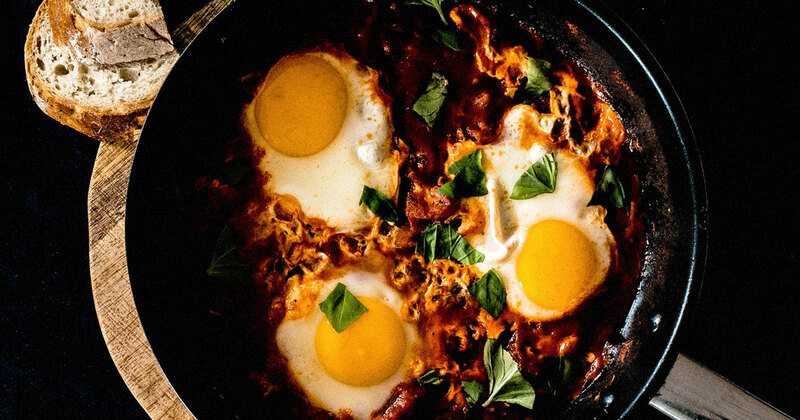 This recipe serves two hungry people, or four people for breakfast. 3 - 4 corn tortilla wraps. You can buy a pack of eight and use the rest to make nachos! Preheat oven to 170 degrees and heat up the grill. Sauté cumin seeds, onion, chilli and garlic for 6 - 8 minutes until everything is soft. Add garam masala and paprika and stir for a couple of minutes. Stir in chopped tomatoes and simmer for 5 minutes until it’s slightly reduced. Throw in the black beans and cook for 2 minutes. Season with a bit of salt and pepper. Grease a 20 x 20cm baking dish (or roughly that size) with oil, season the bottom with ground pepper and a pinch of paprika. Line the bottom and sides of the baking dish with the corn tortillas. You may need to cut them in half so they fit properly. Pour the tomato mixture on top of the tortillas and make four wells with a spoon. Break eggs in to separate mugs and pour one in to each of the wells. Bake in the oven for 8 – 10 minutes, top with cheese and grill for 2 - 3 minutes until the eggs are cooked but still a bit runny. Sprinkle some chopped coriander on top and serve with homemade nachos.